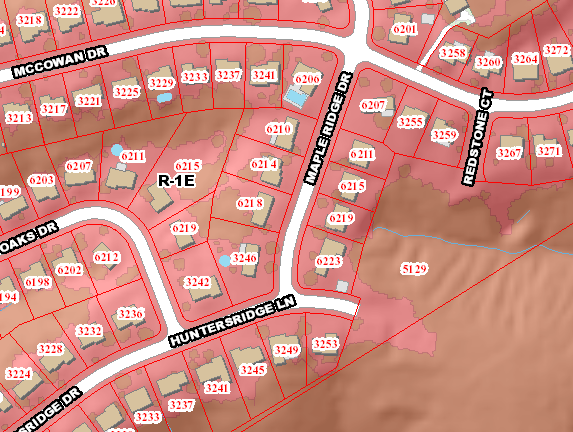 Developer Chuck Berling asked the City of Taylor Mill to approve a motion to consider putting a small cul-de-sac or a T-turnaround at the end of Hunters Ridge to allow two homes to be built in the empty lots at the end of the street. The city commission denied such a consideration on both options, but did vote to allow consideration of a standard-sized cul-de-sac. The City Commissioners were reluctant to allow a change in the recently adopted guidelines that were recommended by Planning and Development Services (PDS) of Kenton County and were put in place earlier this year concerning zoning rules for suburban development. Part of their concern was the ability of Public Works to easily access the street for snow plowing in the winter and also the ease in which garbage trucks could pass in and out of the dead-end street. Mr. Berling's concern, though, was that a larger cul-de-sac would force the houses to be pushed farther back onto the lot due to the setback zoning code of the city. Setting the houses further back, he explained, would disallow Fischer Homes from building larger houses with attached garages like they had built in the rest of the subdivision because there is a steep ridge in the back of the properties. Smaller houses would have to be constructed on a standard cul-de-sac and Berling said that even if Fisher Homes were still interested in the properties, the smaller homes would not match the rest of the neighborhood. “You may end up with nothing but two empty lots,” Berling said when it was voted to only consider a standard-sized cul-de-sac. --Wayman Branch Road will be closed for 45 days beginning on June 1. The road has suffered slippage in five different areas in Taylor Mill and two severe areas in South Covington. Wayman Branch has been an ongoing problem for Taylor Mill for some time and Mayor Dan Bell said that he has called upon regional officials to address the problem more permanently at the Ohio-Kentucky-Indiana Regional Council of Governments meeting. He said that funding for the road slippage must come from either state or county coffers. --What is red, octagonal in shape and going up at the intersection of Mapleridge Drive and Taylor Creek Drive? That's right, a stop sign. Recommended by Taylor Mill Police Chief Steve Knauf and supported by residents who live in the area, the sign is expected to go up sometime early next week, according to Maintenance Director Mark Roden. There will also be a stop-ahead sign reminding drivers about the new stop sign, and an incoming-traffic-does-not-stop sign under the stop sign at the three-way stop. --Taylor Mill appointed Sharif Adrabbo to the Kenton County Code Enforcement Board. Mr. Adrabbo explained that the Code Enforcement Board examines issues that deal with the private properties and businesses that do not maintain their property up to Kenton County code. When a complaint is made and individuals are eventually issued a citation, the Code Enforcement Board reviews the situation, hears from the cited individual and makes determinations for any appeal possibilities.